I’ve been so obsessed with these books lately that it’s actually been an effort to pick up something not written by Rachel Vincent, just for the sake of blog-post variety. 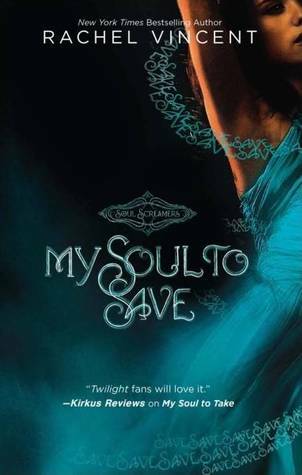 I only have the first and second (this one) books in the Soul Screamers series, but there are going to be tantrums if I can’t dredge up the other books soon. When teenager Kaylee screams, someone dies…So when teen pop star Eden dies onstage and Kaylee doesn’t wail, she knows something is dead wrong. She can’t cry for someone who has no soul. The last thing Kaylee needs right now is to be skipping school, breaking her dad’s ironclad curfew and putting her too-hot-to-be-real boyfriend’s loyalty to the test. But starry-eyed teens are trading their souls: a flickering lifetime of fame and fortune in exchange for eternity in the Netherworld – a consequence they can’t possibly understand. Kaylee can’t let that happen, even if trying to save their souls means putting her own at risk. I loved the premise of this book; I thought it was really clever. Who hasn’t secretly wondered if Miley Cyrus or Selena Gomez hasn’t sold their souls to get where they have? Ah. Just me then. Anyway, the plot revolves around Addison Paige – a pop star ex-girlfriend of Tod’s who has traded her soul for fortune and fame. Naturally the hellion she sold it to isn’t likely to hand it back without a fight, so that’s where The Amazo-BeanSidhe-SuperGang! Kaylee and her friends come in. It’s rare that the second book in a series has a plot that works as well as the first, but this one definitely does. The plot moves at a fair clip; it’s rare that the story gets bogged down. I think I’d have preferred it if Kaylee continued to live with her Uncle and cousin instead of her Father – the absent but vaguely loving Dad thing worked a lot better. It annoyed me a little when Kaylee wouldn’t stop whining about the possibility of being grounded but hey, I can deal with that. And now for a complete change of tone. I’ve just wandered off to go and look at other reviews (with my notes firmly planted in front of me, so my opinion’s don’t accidentally change) and there are a ridiculous amount of rants about how ‘unfeministic’ these books are because a female bean sidhe needs to be calmed by a man. What!? What’s wrong with you people!? Look, I’m a woman and I’m completely for female rights and emancipation. Of course I am. But nothing winds me up more than people looking for problems when there aren’t any. It’s well-established mythology that female bean sidhes (or banshees) wail to foretell death. Ms Vincent added the part about the men being able to Influence and therefore calm the women, but it’s nothing to do with the female bean sidhes being weaker – Nash even says in the first book how the female traits are way more useful than the male. Aside from anything else, she doesn’t need Nash to stop her wailing at all; she does so perfectly well in My Soul To Take. In fact, she does a lot of the action on her own, while Nash admits to his ‘powers’ being useless without a female. Look, I know I’ve gotten off-topic here – but this is why female bloggers get a bad name. Stop looking for secret agendas that aren’t there. Uh… anyway. I really liked this book. You can probably tell by my stressful defence of it. Tod’s character is perfect and I liked how we got to see a softer side to him in this book. Truth be told, I’d rather have him than Nash although it’s a close thing. I also liked how we actually visited the Netherworld this time – I was curious about it in the last book and it’s detailed extremely well in this one. I do think that the ending of the last book should be dealt with a little more. I mean, something that big needs to be used as something more than a passing comment. Kaylee’s quite clearly not bothered by it at all and I’d have liked a little more musing on it perhaps. So, irrelevant rant aside (I did consider deleting it, then decided I’d only fume inside my head instead – I can’t help it. I liked the book too much to let it be slandered for no reason), there’s a unique plot, great characters and a creepy new world to explore. I’d recommend reading My Soul To Take first, just so you know what’s going on, but this book is just as good. Ugh if you're loving these books so much I'm going to have to get hold of them soon, but I have just got a copy of Stray, book one in her adult Shifters series. I have a THING for werewolves and shapeshifters and I'm totally a cat person. WERECATS, Hanna, WEREFUCKINGCATS!! Heard great things about all of her stuff to be honest, she's usually up there with Kelley Armstrong when I see people squeeing over good urban fantasy.